I have never been a fan of turkey chili. In fact, there are very few recipes in which I like ground turkey — period. I usually opt for extra lean ground beef instead. But, as part of our effort this past football season to experiment with as many different types of chili as possible, I caved and started searching around for ones that used chili. And this was our turkey entry into that food challenge. It did not disappoint! With this recipe, you actually get a twofer. Well, really a threefer. It’s delicious, extremely healthy, and is conveniently prepared in a slow cooker while you are out and about all day. Basic, cheap incredients. Save yourself a bit of time by pre-chopping the fresh veggies the night before cooking. 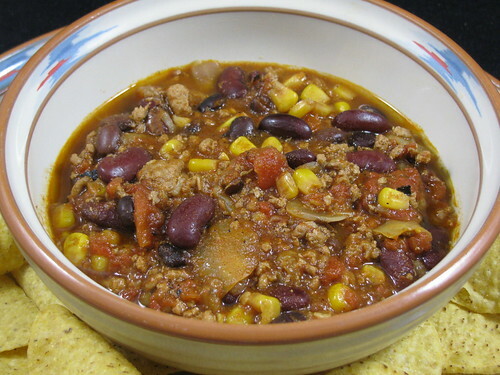 Dump tomatoes, kidney beans, black beans, frozen corn kernels, and spices into the slow cooker. Sautee peppers and onion in oil, then add the turkey until browned. Cook on low all day, then mix together well when done. Enjoy by itself, or serve with chips and your favorite toppings. Put the tomatoes, kidney beans, black beans, frozen corn kernels, and spices into the slow cooker. In a large nonstick skillet, sautee the peppers and onions in the canola oil on medium heat. When the onions are soft, add the ground turkey and continue to cook, breaking the turkey up into small chunks with a spatula or spoon. When the turkey is browned and cooked through, add the turkey, bell pepper, and onion mixture to the crock pot and stir to combine. Cook the chili on high for 3-4 hours or on low for 8 hours, then mix well. Season with salt, pepper, and Tobasco to your taste. Serve the chili hot in bowls with your choice of garnishes. Looks great BUT a big flaw in this recipes is that you are not giving the size of the products to be used, so I could be using the large size and the taste will be different than if I were to use the smaller size cans. Would be very helpful if that was spelled out in your recipe.